A power, a beacon of all of the lights in his life. An inner calm brought forth through dreams. The hounds rushed, but his blades transformed, and with them came new visions. Visions of the past. Past friends, mentors. Conversations long since forgotten. He heard their voices, he felt their presence, his blades became a shining sword and shield. It ceased to become a vision, and entered dreamspace. He stood fighting, their power transfused into him. Fighting for hopes and dreams in a world of ruin. Eventually the hounds overcame him, but there was a sense of peace within, that he was not alone. For the first time in over a month he awoke feeling rested. Perhaps death would come, but for now, he felt ready to face the world. First, though, he opened his notebook to the first pages he wrote, and began to re-read what he had written. To remember the faces he had long since forgotten, and their words to him. A wandering soul. Found, not lost. He was surprised at the invitation to join the House of the Triad, although the nature of his work demanded he decline. Much as he had declined Astra's offer to officially rejoin the Arcane Tower. His mind filled with thoughts and reflection as he walked through Cordor. "For the sake of my writing, I strive to be neutral. As much as possible, so I may travel and capture the tales of all peoples upon the isles. I need to avoid taking a stance on things, I need to hide my beliefs. It pains me, some of the things I see, some of the things I hear. But I cannot say anything, I must be silent and complacent to it. the fight against my own nature. I am the horizon. Dawn and dusk are meaningless quantifiers for something which is the same. I stand between them, on a thin line, to observe the passing of time for what it is. The sun will rise and so shall the moon. Clouds will pass overhead and obscure the sky, rain shall pour, lightning shall strike, snow shall fall. Yet always, the sky and horizon will always be there. The horizon is a place that can never be reached, a boundless journey that can never be fulfilled. I walk endlessly to that horizon, writing all that I encounter along the way. Through discipline and wit, knowledge will prevail." He was grateful for those around him that would help him on his path. The long walk along a horizon, the line that separates day and night. The symbol of his path that began many years ago. Garrett made his way to the apex of the Arcane Tower, to the altar of Azuth. "I regularly give thanks for my spells, for the work of those who came before me in their research, and for self-control and reason in my magic usage. Today, I pray for inner strength to maintain my discipline. I finally pushed myself far enough to learn something I cannot unlearn. I pray for the discipline to act with a rational mind, unmarred by the impulsive nature of emotion. " On these thoughts he closed his eyes and meditated, much as he did when he first took Azuth as a patron deity some years back. Although his primary focus had changed, in this moment, he needed the clarity and focus. Every single lesson he had received, every single spell he practiced, every single mantra he had taken into himself. A cumulation of his life to this point. His mind reflected on thoughts that developed over the years. His original resolution, that life must be examined with logic, not sentiment. The path that would feel the best was not necessarily the best choice. Much as fire burns, it would leave smoldering bridges in its wake. And as ever, it held true. Except now, instead of smoldering bridges would be a searing wake of war and corpses of innocents. He never wanted to ask himself how he ended up at this point in his life. His decisions must be conscious, he must be aware of each action as a step along a path. The destination is not an accident. And on that path, he wanted to believe there is a white step and a black step, and that he had the clarity to see the actions for what they are. He wanted to believe in a greater good, and that he could contribute to it. He wanted to believe everything would work out for the better. And most of all, he wanted to believe he could make the world a better place through recording its history. He felt this was attainable, he had made progress doing so. A delicate balance of day and night, the shadow of goodness within himself that he refused to give up. His existence became a duality and a paradox, he had come to accept this. This was his life now, surrounded by mystery and embracing experiences he would have never dreamed he would encounter. And embracing the answer to that moment a year ago. The meaning within himself at that point in time contrasting to himself now. Every action had to be calculated with precision, there was no room to act out of impulse and risk taking each moment as they came. Friendship is a thing that can exist, however he found himself being too free in who he gave it out to. He was too open, not strict enough with himself. The abstract sense at the back of his mind was given form, and at long last was confronted. Hardness of resolve, strength of will, presence of mind. Three aspects, each capable of being good or evil, it was his choice that determined where his foot fell. He felt a sense of wholeness, as every moment came together to this point. He no longer held regret over lost dreams. Long had he told himself dreams weren't waiting for, reality is what he made of it. And now, he felt it within himself. He felt closer to his mentor's words than ever. He watched first hand, the contrast between glory-chasing versus the recognition of one's true place in history. Leaders understand their role in the world, and Garrett understood his. Few seemed to understand their own role, and exposed themselves to weakness in their pride and greed. "The world is what I make of it. But what kind of world will I make?" Strength and help came from those around him. No longer did he feel like crying out into the night-- The pain of the past left him. Garrett stared out his window at the sunlit land outside, the quiet cobbles and glimmering sea standing silent as dawn illuminated the sky. Reflectively, he sipped from a cup of coffee, an newfound calm within. The reality that was his to partake, new dreams given form. Garrett laid sprawled out on a couch in his apartment, a stack of fundamentals of magic books on the floor nearby. Advanced Transmutation open in his hand, yet neglected as he stared out the window towards Cordor, distracted by his thoughts. A giant heap of information placed into his lap. He transcribed it, just as he said he would, but it weighed on his mind-- What effect would releasing it have? Once out, there would be no taking it back. It was dangerous information that would actually harm people. Potentially people beyond the ones the donor intended. "That's the thing with information. Once in the wild, it's hard to say what will happen with it." He thought to himself. He would have to run the book past others. A certain wizard came to mind. He laid his head back, taking a deep breath and exhaling slowly. Many questions certainly were answered. Garrett reclined on the couch within his apartment, sprawled out with a book in his hand, A Primer on Divination. He debated on if he wanted to relearn the school or not, especially given the brush he had with deeper visions. Respite from the school was relaxing in its own way, his surroundings were significantly less colourful and easier to look at. And yet, no longer seeing those colours left the world feeling emptier somehow. The day's training and reading left his mind ready to take in more. He closed his eyes and breathed at a slow and steady pace, entering a meditative state to focus on his mind's eye. That which was foreseen, that which exists. The delicate balance had been lost. The Mirror began to shimmer, reflecting truth. The Prophecy of Ouroboros came to pass. And with it, the field changed. mantle forsaken, and with it all hopes of life. removing itself from the world of action in hopes to find peace. PAINED BY WHAT IT SEES OUTSIDE ITS CAGE. FOR THE SERPENT HAS NO FUTURE. maintaining an orchard of lies. It feeds all who approach, just as it feeds itself. Promising chaos, embodying only tumult. ENDLESSLY FIGHTING BACK THE FLAMES. each flame casting a different light. burning all who dare near the blaze. a phoenix of destruction and rebirth. THE FLAME SHALL BURN, AND WITH IT SHALL BURN EVERYTHING. GOOD AND EVIL HOLD NO WEIGHT, THE FIRE CONSUMING ALL. AND YET, THE BRIGHTEST LIGHT BESTOWS A FAINT SHADOW. Its weapons closely guarded, held reluctantly. Cautious and calculating, seeming almost unmoving. Yet tasting the orchard's fruits it drew its blade without hesitation. The duality of cold hatred quelled by the fire of zeal for itself. held back only by tempered will of its nature. THERE IS A FUTURE OF SHADOWS CAST FROM LIGHT. THERE IS A FUTURE OF IMMOLATION. IF THE FLAME CANNOT CREATE IT SHALL DESTROY. The Fifth Serpent had been uncovered. A trace of an outline, still unseen. The Serpent of Mirage, cast forth only by light revealing its presence. AND SO I HAVE SEEN IT, NOW DO I KNOW. THERE WILL ALWAYS BE A BALANCE. SO TOO SHALL THERE BE AN ILLUSION OF DAY AND NIGHT. MAY THE SHADOW OF SUN-AND-STARS ESCAPE THIS FATE. Time passed, the day shifting to night as he meditated. He opened his eyes and looked around his room, at the trails of fire, water, and air from the souls he let into his life. Garrett sat at his desk, papers strewn about and a book open to an empty page, yet quill still in his hands as his mind ruminated. Life was strange. He came to accept long ago that it would be, but, somehow things kept on getting stranger. At some level he wondered if his choices were becoming increasingly incompatible with living a long life, but, he wasn't certain if he cared either. The ever-present conflict weighed on his mind. The never ending struggle, the constant war. And yet, were there any goodly people fighting? Or were they all their own independent tribes, each behaving exactly the same as one another, just with different language to justify it? It bothered him, his increasing apathy towards violence. He felt he shouldn't be apathetic. And yet, if unscrupulous people do things to other unscrupulous people, did it matter? These were all acts of war. His remorse was saved for innocents, the few who do not engage the island's intrigues, who sought to exist peacefully. And his remorse was saved for those who suffered unjustly. He leaned back in the chair, abandoning the quill onto the table, his mind reflecting further. "This is what happens when the ends justify the means. Not that I'm any better. I try and be aware of where my foot falls, although, maybe that just makes it worse. I have no place to claim moral superiority. But, maybe moral superiority isn't what we should aim for to begin with. My fight is focused on specific concepts. Specific targets. Specific goals. If I judge another, it's because they've violated my personal tenets. It's a strange path, but, I've made some progress, I've averted war and kept innocents safe. My hand invisible and a mark in history never made, a sign that I've succeeded at something. I can't rest on those laurels though, succeeding at one thing isn't good enough. Violence and bloodshed are inevitable facts of war, I'm seeing it more and more. But as always, I'll watch and wait for an opportunity to act. Tub, I was surprised to see you still alive. I keep wondering if we'll meet again, and what I'd even say during that meeting. You suffered more than I did, you know what it's like. Most of the trouble I get into I could probably talk my way out of, but our goal? We're dead men walking. It's by wit alone that we live and die. I hope to work with you again, although I doubt you'd ever walk with me. There is hope. I wish I could tell you that, but, those are dangerous words to say." He thought to himself as he wandered the roads, making notes. Reflections on words exchanged with a second party after having picked up the job. The conversation hurt in ways he didn't know he could feel, trying to explain the difference between a murderer and assassin to someone who wouldn't listen. It brought to the forefront of his mind how he didn't belong among them. They fought their own fight and would never understand his. But worst of all, they were aware of the evil of the world. They were aware, and did nothing about it. They chased every single easy target, ignoring the ones that mattered. They were complacent with suffering. He didn't belong among them. His fight was his own, only a handful of others sharing the same vision. It had been a while since he had felt a strong dissonance between the aspects of night and day. Visions. The Sight gave an intense focus into whatever it saw, and the depths of the cavern of ruin overcame him. Howling walls of failure, arms and legs caked in bloodied mud, stones cut by piercing winds. Real or exaggerated, it overcame the senses with a ferocity outside of his ability to control. Thinking back, the last time he had a vision like that, the only person he had to talk to threatened him with death several times during the conversation. He should have figured out then and there that person was conspiring to isolate and destroy him. But, he figured this was just how things worked in life. Maybe he just expected that everyone around him planned on using him until he was no longer useful. He sighed, catching his thoughts. He really was too paranoid to socialize with people normally. But, seeing how he was alive and not dead, it was time to be productive at least. 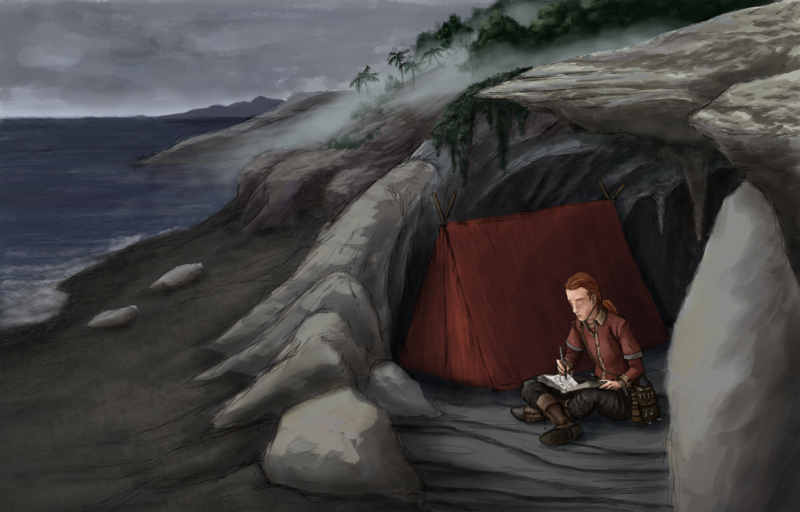 He threw on his caravan clothing, gathered his bookbag, and made a tent out of spare materials he had lying around. It was time to wander. Perhaps to go and search for books in places long forgotten, perhaps to find somewhere quiet to read. But, before leaving into the wilderness, he went into Cordor for one last thing. He felt dead inside, it felt fitting to pay respects to the graveyard of dreams in his soul. During the dark time of hound visions, a dream of two heroes and their words brought him clarity. He walked to the jeweler and bought two necklaces, thin silver chains with tiny charms. One having a small red gem, the other a small prismatic gem. He wrapped one around his left wrist, and one around his right wrist. A horizon between aspects. Their words drew him from the depths of vision before. He hoped, as a focus, their words could pull him from the depths of vision should he find himself stuck again. He lit incense made of materials gathered in his travels. At the base of the piled reagents laid a paper with a question written on it, the intended focus of his sight. His previous visions left him with questions, things he couldn't see, things he wanted a deeper understanding to. Instead of casting his vision out broadly as he had in the past, he honed in to answer previously unanswered prophecies. Things that hadn't come to past. Or, if they had, eluded him in their meaning. What is the flame that will either create or destroy? He needed to understand. He closed his eyes and inhaled deeply, gazing into his inner eye. The field had changed dramatically. He could sense a greater world around him. War, conflict, hate, suffering. And yet in the centre, the focused area, was a place of stillness and peace, as though time had stopped. He stood with his body pressed to the mirror of vision. The mirror, a reflective window. A reflection of the world onto himself, just as much as it depicted the world itself on the other side. A thing to gaze through but also gaze back upon. He realized he was lying down, his body in a shallow pool of water. He arose, the pool reflecting the starry night above him. Fireflies flickered all around, illuminating the glade. Overgrown ruins, with fresh cut stones and lumber nearby, signs of construction. The stars in the sky spelled out celestial runes. He couldn't speak the language, and yet somehow he understood. In a world of ruin, something must stand as a monument for times past that would otherwise be lost. In a world of ruin, something must stand as a guide. A reminder as to why things should be rebuilt. What should be remembered. The pool was strangely warm. He realized it was glowing. Four candles floated around its bank, reflecting perfectly in the still waters along with the night sky. And yet, as a window, something stirred from within. Garrett gazed into its waters, seeing the same landscape as around him, except engulfed with flame. A wildfire, smoke blotting out the sky. A distant past perhaps, the same buildings that surrounded him appeared to be whole yet burning within the reflection in the water. Or perhaps this was a vision of the future, after the construction had completed. Or perhaps both of these were the same thing. A cycle of creation and destruction. In the fires he saw different runes which he could barely recognize, and yet, the meaning was imparted onto him. The flames are destruction. War is never accidental. Structures will decay, all will eventually die. Nothing can be stable forever. The flames are rebirth. From the flames a better future can arise one way or another, as long as it is worked towards. An end is only an end if we let it be. The star patterns he envisioned in 144. The celestial daggers of dreams. The ripples of the waves shifted their forms. His own two enchanted daggers. One bearing a silver pommel in the shape of a pine cone, embedded into a rocky base. The other dagger lay flat on the ground submerged under water, obscured from sight. A candle with a flame dancing to the breeze. A composite volcano island, steep and crowned in flames. Waves beat against its shores, and a tempest whipped its smoke into quickly shifting runic patterns. His vessel of being, splitting into two chalices with the shifting waves: One white, one black. Neither bearing celestial symbols. From the symbols he drew meaning, and saw the answer to his question. All elements come into balance with one another. A balance must be maintained. And so I once saw, now do I understand. The flame cannot consume all, for in doing so it will suffocate. Just as the breeze exists because the heat beckons its drafts. And so too do I see my place in the world. There must be a balance. Where there is day there must also be night. I want to be the guiding starlight to the causes I have chosen. To see a broader world is to understand there will be war and death and things outside of my control, and to accept that it will exist. I can equally leave a mark upon the world, by existing I have the choice to lead by example. For greater knowledge and expression. But, this is the present, this is what already is. If there is a prophecy here, I do not yet see it. And yet I do not feel a burning need to understand any further what I have seen. To see a reflection of myself has given me the meaning I needed. He looked up from the pool, his surroundings having changed once more. For a brief moment he saw an athenaeum within a forested glen, water filling the reflecting basin from a gentle stream flowing off a mossy cliffside overhang. A soft light filtered in from the tree canopy high above, he couldn't tell if it was day or night. The place from the dream. "Chancellor Freja's dead. Died fighting for Arelith to necromancers and vampires." Garrett rushed from his apartment out towards the city.